Take Part in a Worldwide Project! I want to make a global work of art, with banknotes from all over the world. The idea came when making my collection of banknote jewellery. This collection is made of real money that is valid now. In other words: if you would unfold the jewellery you could take the banknotes to the shops, and pay for your goods. It started as a comment on the perceived value of gold jewellery and of money, and has made me curious to find out more about money. How does it plays a role in our daily lives, and in international connections? •Discovering what you think about money. 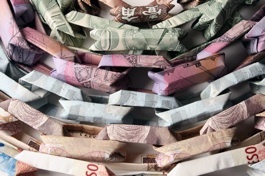 •Collecting banknotes from as many different countries as possible, linking them together to make a cloak. The money cloak symbolises solidarity, keeping us warm. We can shelter under it together. But it can also hide things we do not want to be revealed. In this way it shows the tension between how we would like money to be used (giving everyone a fair chance in life) and the sometimes harsh reality of money-making and its influence on the world-wide economy. Only if we all work together will this piece become reality. Please send me a banknote from your home country or last holiday destination! I would like you to include some information and your opinion about money. For this, please use the form in the Project Information sheet. You can download the form through the links on the left, or here: as PDF file or Word document.